You’re probably aware of the importance of pH, especially when talking about watering systems and treatments. But how well do you really understand it? pH is the abbreviation of “power of hydrogen” (the ‘H’ is capitalized because it represents the element symbol of hydrogen, and it is standard to capitalize those). pH measures the hydrogen ion concentration in a water-based solution – whether water itself, or solutions containing water, such as blood or intestinal fluid. The pH scale usually runs from 1 to 14 – 1 being very acidic, 14 very alkaline (basic). A pH of 7 is considered neutral. Each whole pH value below 7 is ten times more acidic than the higher value. Each whole pH value above 7 is ten times less acidic than the one below it. With the new understanding of what pH actually means, how does it relate to poultry? Neutral water, which is neither acidic or alkaline, has a pH of 7. But this isn’t as common as you might think. Most water sources fall on either side of neutral, depending on location, geology, and other environmental factors. Before you can make any changes to your pH, you have to get a baseline reading of what it is. You can accomplish this with inexpensive pH test strips. Low pH is aggressive and causes mineral leaching by releasing lead, copper and other minerals from the pipes into the water. A lower pH reduces scale and biofilm buildups, which harbor pathogens. A lower pH also creates an unfavorable environment for bacteria like salmonella. 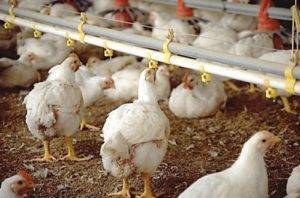 High pH imparts an undesirable taste to poultry, and will cause them to back off water, decreasing performance. Studies have found that birds can tolerate a wide range of pH water, being virtually unaffected by pH levels of 3, 4 and 5, tolerating levels up to 8. A pH less than 5 corrodes metals and results in mineral leaching and shortens the lifespan of the system. Poultry prefer water with a pH of 6.0 to 6.8. However, water with a pH less than 6 has been shown to negatively affect chicken performance. A pH of 5.5 – 7.0 keep minerals suspended in water and increases the effectiveness of antimicrobials. Knowing your starting pH and adjusting properly will help prolong the life of your equipment, improve the efficacy of your cleaners, and help improve bird performance. If you haven’t checked yours in a while – now’s the time.